If you are a gardener, you know that roses, like many plants require plenty of space to grow. This requires you to thin the stalks in early spring so the remaining ones have plenty of room for light, water and growth. This makes for not only healthy and hearty roses, (resilient), but also beautiful, as you can see by this photo taken of our first blossoms last week. It’s Saturday morning and I want to walk the dog, take a yoga class, plant flowers, clean the house and get a pedicure before I get ready for a luncheon I still need to make an appetizer for… Does this sound remotely familiar? Trying to fit in as much as you can, focused on how much you have to do and the little time you have to do it? This inevitably crowds my blooms and leaves me frustrated, resentful and anxious. In order for us to be our most happy, healthy and resilient, we need to make space to grow which sometimes means pruning the volume of activity scheduled. More is not always more. Sometimes less is more. But what blooms to give up? While everything can feel important, there are a few things that are most important. Ask yourself, What is most important in this moment? And then be extra generous with the time you allot because everything takes longer than you think. So I skipped my yoga class and practiced at home, postponed my pedicure and planting flowers, and spent my morning on a lovely walk, tidied the most critical parts of the house, made a lovely appetizer for the party—and actually enjoyed it all! I arrived at the party refreshed and renewed instead of rushed and resentful. 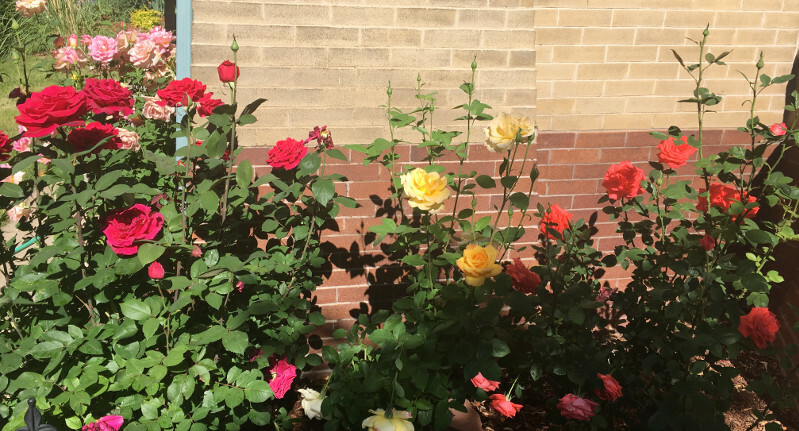 Like our rose bushes, to create your brightest, healthiest, and happiest self, you can prune your number of activities and to-dos to give yourself space to blossom and grow in your life. This is resilience. Wonderful message- excellent analogy! Love your first roses!! Thank you! Thank you Martha! Hoping you will make some space for your transition. Great message to do some instead of everything! Feel more rested and actually have some fun, wonderful! Yes, Gwen! So simple, but we seem to need this reminder. Great message! And beautiful roses! The irises you and Neil gave me are blooming like crazy. Thank you! Thanks Sarah! Happy to hear about your iris blooms. Hi Judy! Funny, but I hear that alot! NOW is the time to take charge of your schedule!!! !